Prime Minister Ehud Olmert told a powerful parliamentary panel on Monday that Israel rejects "no options" to block Iran from obtaining nuclear weapons, a meeting participant said. The statement was the Israeli leader's clearest indication yet that he is willing to use military force against Iran. "Israel clearly will not reconcile itself to a nuclear Iran," the meeting participant quoted Olmert as telling the Foreign Affairs and Defense Committee. "All options that prevent Iran from gaining nuclear capabilities are legitimate within the context of how to grapple with this matter." The meeting participant spoke on condition of anonymity because the session was closed. Despite the clear hint that the military option remains on the table, CBS News correspondent Robert Berger reports that Israel considers it a last resort. However, Israel doubts the U.S. will attack Iran, and that has increased the possibility of an Israeli pre-emptive strike on Iran's nuclear facilities, Berger adds. 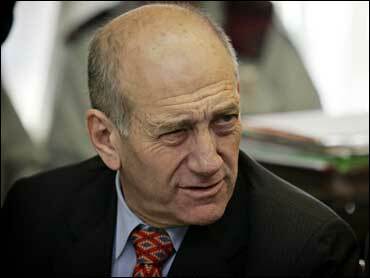 Olmert addressed the panel days after discussing Iran's nuclear ambitions in talks with President Bush in Jerusalem. During that visit, Israeli officials disputed the recently released conclusions of a U.S. National Intelligence Estimate that concluded Iran halted its nuclear weapons program in 2003. In Jerusalem, Mr. Bush declared that Iran remained "a threat to world peace," but reasserted his commitment to trying to resolve the standoff over Iran's nuclear program diplomatically. Israel, which sent warplanes in 1981 to demolish an unfinished nuclear reactor in Iraq, advocates a diplomatic solution to the Iranian standoff as well. But in his comments to the parliamentary committee, Olmert said: "It's clear that Israel won't reconcile itself to a nuclear Iran. We reject no options a priori." Israel considers Iran to be its most dangerous enemy, and Iranian President Mahmoud Ahmadinejad has called for the dissolution of the Jewish state. Meir Javedanfar, an Israel-based Iran analyst, said Olmert refused to rule out a military option "in order to increase the urgency to find a diplomatic solution." "I think this is Prime Minister Ehud Olmert's way of making sure that the international community stays alert on the Iranian nuclear issues," Javedanfar said. "The concern in Israel is that after the NIE report, the world is just going to sit and watch Iran continue with its nuclear weapons program."